Anni Albers (1899–1994) was among the leading innovators of twentieth-century modernist abstraction, committed to uniting the ancient craft of weaving with the language of modern art. As an artist, designer, teacher and writer, she transformed the way weaving could be understood as a medium for art, design and architecture. Albers was introduced to hand-weaving at the Bauhaus, a radical art school in Weimar, Germany. Throughout her career Albers explored the possibilities of weaving as a modernist medium, but one also deeply rooted in highly sophisticated and ancient textile traditions from around the world. In her later years, Albers took up printmaking, but continued to explore textilerelated concerns such as pattern, line, knotting and texture. Annelise Else Frieda Fleischmann was born in Berlin on 12 June 1899 to a middle class family. She was encouraged to study drawing and painting and in 1922 became a student at the Bauhaus. Here she met the artist Josef Albers and the couple married in 1925. In 1933 they emigrated to the US after the rise of Nazism in Germany forced the Bauhaus to close. The Alberses both became teachers at the experimental Black Mountain College in North Carolina. In 1950, following Josef’s appointment at Yale University, they moved to New Haven, Connecticut. Anni Albers has been a hugely influential figure for generations of artists and designers. This exhibition examines her engagement with both the history and potential future of weaving, and the works on paper and writings through which she developed her ideas about textiles. One of the outstanding characteristics of the Bauhaus has been, to my mind, an unprejudiced attitude toward materials and their inherent capacities. The Bauhaus art school in Weimar was founded in 1919 by the architect Walter Gropius, who wanted to create a school that brought together sculpture, painting, arts and crafts. After a general preliminary course students chose a specialised workshop. Weaving was a popular class for women, and – despite the ideals of equality at the Bauhaus – it soon became known as the ‘Women’s Workshop’. Anni Albers said that she ‘went into weaving unenthusiastically, as merely the least objectionable choice’, but ‘gradually threads caught my imagination’. Students in the weaving workshop produced independent artistic works as well as designs for industrial manufacture. Albers and her colleagues created wall hangings, which she later referred to as ‘amazing objects, striking in their newness of conception in regard to use of colour and compositional elements’. The weaving workshop developed its own distinctive language, making use of the grid structure of weaving, and emphasising haptic or tactile qualities. A number of lost wall hangings by Albers were later re-woven by Gunta Stölzl who was Master of Craft in the weaving workshop from 1927 to 1931. Anni Albers’s designs for machine production included her diploma piece, a sound-proof material commissioned to cover the walls of an auditorium. I tried to put my students at the point of zero. I tried to have them imagine, let’s say, that they are in a desert in Peru, no clothing, no nothing… So what do you do? You wear the skin of some kind of animal maybe to protect yourself from too much sun or maybe the wind occasionally. And you want a roof over something and so on. And how do you gradually come to realize what a textile can be? And we start at that point. In 1933 the Nazis forced the Bauhaus school to close. Josef and Anni Albers were offered teaching positions at the newly founded, progressive art school Black Mountain College in North Carolina, US, following a recommendation from the architect Philip Johnson. Set in a rural environment, Black Mountain College encouraged experimental teaching methods and communal living. Artists, dancers, mathematicians, sociologists and architects formed an unusual creative and intellectual community. Anni Albers established a weaving workshop at the college. Her teaching practice encouraged students to increase their understanding of materials and textures. Using everyday materials and inventive methods, Albers explored the possibilities of ‘weaving’ simple patterns and textures without using a loom but using found materials. She also introduced her students to simple back-strap looms, which she had seen on her travels to South America. As well as teaching, at Black Mountain College Albers began to make what she called ‘pictorial weavings’ – hand-woven pieces that were made as artworks to be hung on the wall, not fabrics for everyday use. The textiles of ancient Peru are to my mind the most imaginative textile inventions in existence. Their language was textile and it was a most articulate language… It lasted until the conquest in the 16th century. Until that time they had no written language, at least not in the sense we think of as a form of writing. Anni Albers made a number of works that reveal her interest in the relationship between text and textile. She understood that pre-Columbian textiles served a communicative purpose, especially in ancient Peru, where there was no written language. As a young student in Berlin Albers had regularly visited the Museum of Ethnology and its collection of Peruvian textile art. After emigrating to the US, the Alberses made frequent trips to Mexico and also travelled to Peru, Cuba and Chile. There, she was finally able to handle and even to purchase textile samples like those she had seen in the museum. The black and gold weaving she titled Ancient Writing was made the year after her first visit to Mexico in 1935. Ancient Writing was the first in a series of pictorial weavings whose titles refer explicitly to texts and coded or ciphered character languages. Haiku 1961, Code 1962 and Epitaph 1968 can be seen in Room 8. To let threads be articulate again and find a form for themselves to no other end than their own orchestration, not to be sat on, walked on, only to be looked at, is the raison d’être of my pictorial weavings. Anni Albers distinguished between the textiles she designed for architecture or interiors, and her smaller ‘pictorial weavings’. These works explore what Albers described as ‘a form of weaving that is pictorial in character, in contrast to pattern weaving, which deals with repeats of contrasting areas’. In essence, they are artworks that have been made with the materials and processes of weaving. Albers made many of her pictorial weavings in the 1950s in her house in New Haven, Connecticut. She used a small handloom to create these pieces, several of which incorporate a technique known as leno or gauze weave, where the vertical warp threads twist over each other around the horizontal weft threads. Some works, such as Development in Rose I and II, both 1952, may have been made on the same continuous warp threads, as companion pieces. But since they have been exposed to different conditions, the coloured threads have faded differently over time. The essentially structural principles that relate the work of building and weaving could form the basis of a new understanding between the architect and the inventive weaver. New uses of fabrics and new fabrics could result from a collaboration; and textiles, so often no more than an afterthought in planning, might take a place again as a contributing thought. In her essay ‘The Pliable Plane’, Anni Albers explores the relationship between textiles and architecture, examining its early beginnings and proposing a future where textiles become integral to architectural design. She even imagines a museum where ‘textile panels instead of rigid ones … provide for the many subdivisions and backgrounds it needs. Such fabric walls could have varying degrees of transparency or be opaque, even light-reflecting’. Albers worked on many architectural commissions, collaborating with modernist architects and designers. In 1944 she designed a drapery fabric with light-reflecting qualities for the Rockefeller Guest House in Manhattan, New York. In 1949, when Walter Gropius built student dormitories at the Harvard Graduate Center, Cambridge, Massachusetts, he asked Albers to create the textile design for the rooms. Several room dividers Albers designed and made in the late 1940s are shown here. These woven pieces – likely prototypes for larger works – are portable architectural interventions that can be seen as a kind of experiment in modern living. Our world goes to pieces; we have to rebuild our world … We learn courage from art work. We have to go where no one was before us. We are alone and we are responsible for our actions. Our solitariness takes on religious character: this is a matter of my conscience and me. Weaving is an example of a craft which is many sided. Besides surface qualities, such as rough and smooth, dull and shiny, hard and soft, it also includes colour, and, as the dominating element, texture… Like any craft, it may end in producing useful objects, or it may rise to the level of art. Albers studied the material qualities of yarns, as well as different ways of working with them. Combining yarns and techniques, she was able to create complex, multi-faceted pieces, rich in texture. Using a floating weft technique and brocade weaving (adding surface threads to a basic weave), she was able to integrate additional threads as free lines. She could ‘draw’ with these threads into the structure of her pictorial weavings. In the mid-1940s Albers began to explore knots. She was probably influenced by the German mathematician and knot theorist Max Wilhelm Dehn, who joined Black Mountain College in 1945 and became a friend of the Alberses. Although not a painter, in 1947 Anni Albers began to sketch and paint entangled, linear structures. She may have revisited these drawings when she produced a number of scroll-like works with celtic-style knots in the late 1950s and the Line Involvements print series she created in the 1960s. Whether using paint, pencil or yarn, Albers’s works reflect her often quoted statement: ‘The thoughts … can, I believe, be traced back to the event of a thread. This room demonstrates how extensively Anni Albers explored the theory and practice of weaving. She published two influential books: in 1959, a short anthology of essays titled On Designing, and in 1965 the seminal book On Weaving. Serving as a kind of visual atlas, On Weaving explores the history of the last 4,000 years of weaving around the world, as well as examining technical aspects of the craft and the development of the loom. Albers dedicated the book to her ‘great teachers, the weavers of ancient Peru’, and stressed throughout the text how ancient techniques could continue to revitalise contemporary practice. Much of the source material Albers gathered for On Weaving is shown here. Albers chose to include images of works by other artists such as Jean (Hans) Arp and Lenore Tawney, who was one of the first artists to become well known for her ‘fiber art’ in the 1960s. She also included images of many fragments of woven pieces from Africa and Asia as well as Europe and the Americas. Technical diagrams of various knotting techniques are featured, as well as ‘draft notation’ diagrams which show the weaver how to create the different weave structures and patterns. Threads were no longer as before three-dimensional; only their resemblance appeared drawn or printed on paper. What I learned in handling threads, I now used in the printing process. After giving up the physically demanding task of weaving at the loom, printmaking became Anni Albers’s new means of artistic expression. She experimented with various printing techniques such as lithography, screen-printing, photo-offset, embossing and etching. As with weaving, Albers allowed the printing process to guide her, stating: ‘What I’m trying to get across is that material is a means of communication. That listening to it, not dominating it makes us truly active, that is: to be active, be passive.’ Printing allowed Albers to pursue her interest in colour, texture, pattern, surface qualities and other aspects of ‘textile language’, translating those concerns onto paper. She used simple grids and rows of triangles to create a wide variety of effects that reveal the influence of the pre-Columbian textiles and artefacts she collected and studied. Though Anni Albers kept very few sketchbooks, she did produce hundreds of textile samples throughout her career, which she carefully labelled and archived. The yarns, patterns, weaves and techniques of these samples served as both ‘sketches’ and as an archive of Albers’s ideas. Grouped together, they could be seen as a miniature retrospective of her woven works. If a sculptor deals mainly with volume, an architect with space, a painter with colour, then a weaver deals primarily with tactile effects. Though Anni Albers was in favour of modern design and production, she held a strong belief that technology increasingly dulls our awareness of the tactile, or haptic, as it replaces the need to make things with our hands. Her essay ‘Tactile Sensibility’ begins: ‘All progress, so it seems, is coupled to regression elsewhere. We have advanced in general, for instance, in regard to verbal articulation… But we certainly have grown increasingly insensitive in our perception by touch, the tactile sense… For too long we have made too little use of the medium of tactility.’ Tactile copies of Albers’s studies exploring surface texture (such as those displayed in Rooms 3 and 9) are presented on the shelves, as well as three-dimensional interpretations of her Line Involvement prints. Samples of the types of yarn she used are hanging in skeins and have also been made up into touchable swatches by weaver Louise Anderson, inspired by Albers’s work. Anni Albers made many of her pictorial weavings on the eightharness Structo Artcraft handloom exhibited here. The technique of setting up a handloom is a complex interaction of hand and eye, which requires patience and concentration. 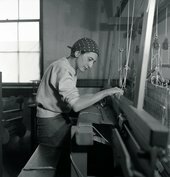 The adjacent film by Simon Barker shows contemporary weaver Ismini Samanidou working at this loom during her residency at the Josef and Anni Albers Foundation in Connecticut. Tate Kids Who Are They? Explore textiles and weaving in the artist’s land of looming! Create an arty bracelet to wear or give to a friend!